.NET Framework 2.0 SP2 v6.2 Final !!! This project is now in a Stable release. All updated versions will be posted here. So please always refer to this first post for downloads. FBWF Cache:-----------> 16 Mb min. - 1 Gb max. This version brings complete Net Framework 2.0 integration into LiveXP. 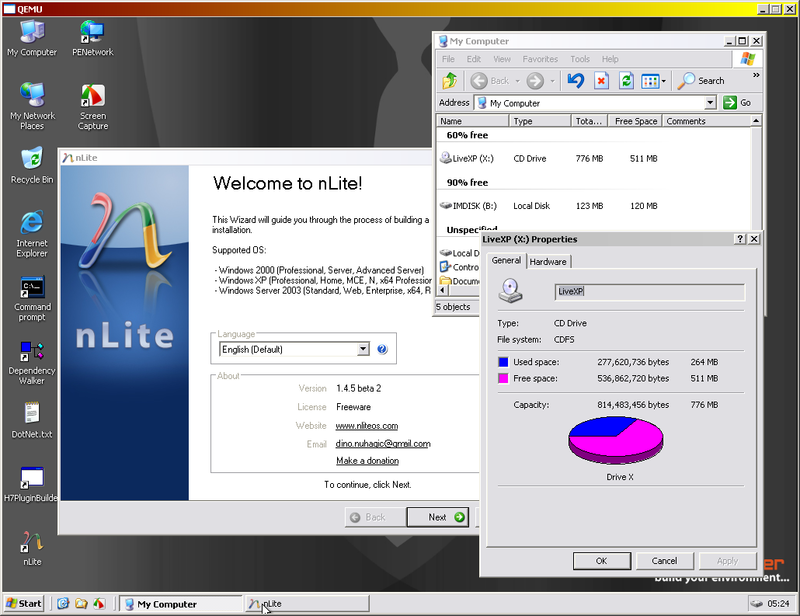 tested using XP SP3 source. FBWF allocated Cache Size and speed depend on the CacheType. disk as virtual memory if a writable physical disk is present at boot-time. dynamic cache types is flexibility in RAM usage as the space is shared. of dynamic cache types is their relatively slower speed. available to the system as RAM. However, it remains the fastest cache type. If you don't have plenty of RAM, better go for dynamic cache type. If you have a strong processor, you can chose the dynamic-compressed cache type. If hardware resources don't frighten you, then go for the pre-allocated cache-type. dotnet2_henshaw-bin.Script) into the same projects subfolder. Do not rename them unless you know what you're doing. 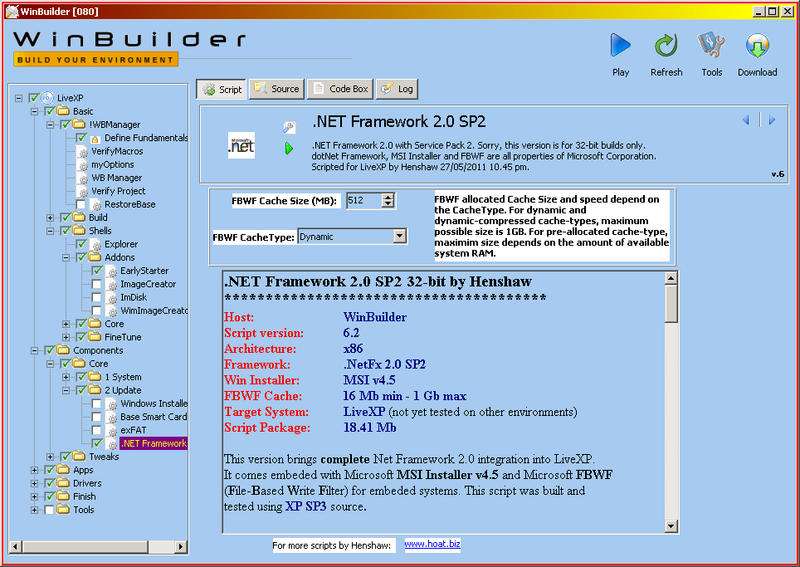 Select the script ".Net Framework 2.0 SP2" in WinBuilder. seeing those nag screens. So it bagan. of the native assemblies. A few programs ran. Everything slowed-down. Script v2.0 - Re-scripted from scratch. No more "cmd.exe" hacking. Virtualized netFx2 to a stand-alone JIT-hook. slowed down LiveXP at runtime and threw nag screens here and there! Began the dotNetRunner as a service "dnr.exe"
Script v4.0 - back to full integration technique without hard-patching. Script v4.3 - Set script dependencies. dotNet apps no longer complain. recomendations to make things flow. Script v5.1 - Clean-up of unimportant entries. dotNet to run when booting from CD. Embeded the Microsoft FBWF (File-Based Write Filter). Script v6.2 - Cooked-in some tweaks! Enjoy your favorite dotNet apps !!! Wait a moment, please. Something went wrong with the uploaded package. please update ! netframework 4.0 for me ! Edited by MrChucong™, 23 March 2011 - 06:54 AM. Thank you for sharing, just note that the "Hello world" is not an appropriate section for placing your post. This could go nicely under the LiveXP section or the App script section of the forum. I will move this topic to over there. Again, thank you for sharing you nice work. It's OK to move the post where appropriate. I will learn to make a better use of this forum. Henshaw, what about running a service that requires .net 2.0? Should I change the "ImagePath" for the windows service to include cmd.exe /c? For example: "cmd.exe" /c "C:\Windows\LTSVC\LTSVC.exe"
<I haven't tried it yet but it should work as long as the "/c" parameter is used to keep open a tunnel to the virtual dotNet file-system. I will try running some servces then evetually make some fixes. After some debugging, i found and fixed what made version one of my dotNet Framework 2.0 Runner to quit unexpectedly at runtime. So I have just finished making version two and changed it from .Net2.0 to .Net2.0-SP2. Seems faster, more stable and reliable. Now writing a short tutorial for it. I will upload it later today. because I did not include the IL-NativeImages for space reasons. size to about three times. More to that, to make a reasonable size, I had to apply some compression. 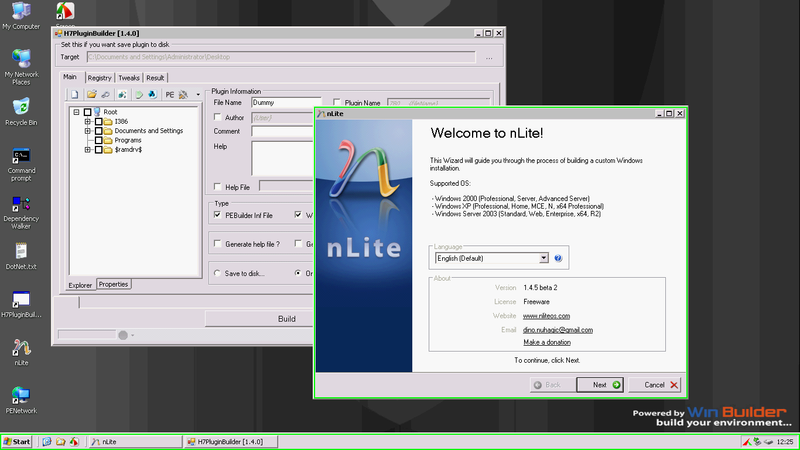 Some applications, like nlite, will report missing dependencies-errors then quit. scratch once more. I will do that in version 3 of this script. LODR_Thinstall_Support script. So, make sure to include that in your build. topic for my dotNet 3.5 script. Edited by Henshaw, 21 April 2011 - 09:57 AM. Now checking to see what went wrong. 1. My modified cmd.exe prevented imdisk from loading in LiveXP, hence, no profiles folder. 2. dotNet framework on windows systems, stores files in a slightly different way from what compilers make dotNet applications to expect. However, the operating system, makes ajustments on-the-fly to make things work. Since that does not occur with the virtualized system, many dotNet applications thus fail even though everything was put in place as the original system. 1. I wrote a small script (dotNetRunner) which will take care of such things while applications load. 2. cmd.exe will no longer be replaced. Instead, dotNet applications will be passed to "dnr.exe" (dotNetRunner) without the "/c" parameter. I tried last night on about 50 dotNet applications. Most of them ran smoothly while just a few still complained. Let me investigate a bit more before I upload. For those who downloaded versions 1 and 2, sorry. Version 3 will be up soon! So, where we can download result of your latest research? Edited by bbk, 13 April 2011 - 01:40 PM. I will put on the links within this weekend (at most in two days.) Sorry for making you wait so long. I was so busy at work. .NET Framework 2.0 SP2 v4 is here !!! some more time to put down version 4. Pick it from the link above. Version 4.0 has been updated to v4.3 !!! Works with "Recommended" and "Complete" builds. I am still working on it to make it compatible with minimal builds. dotNet 2.0 SP2 script depends on IE_06.script, xpe-pnp-aio.script and xpe_directx.script. For .Net Framework capable builds, I recommend XP SP3. I can't get the latest version to work (.NET 2.0 apps throw initialization errors). Strangely, the same thing happens in your pre-built ISO with nLite and H7....could there be something wrong with the uploads? be a write error to the system disk. dotNet needs a writable system disk. time to fix the write error when booting from Qemu or from CD. I will find some time within this week to fix and update the script to v6. - goto menu "Bootable==>Write Disk Image..."
- your drive is now ready. You will thus obtain a fully functional bootable dotNet2 LiveXP USB drive. Let me know if it still complains. Thanks for the quick reply, Henshaw! I build my ISOs with FBWF enabled, so I didn't check if your ISO was read-only. I just checked and .NET 2.0 apps will not run on my ISO with a 128MB FBWF (max possible) writable system drive; does it have to be larger? Also, the notes say that MSI v4.5 is included, but I was not able to run .msi files (I generally include either the RegFactory installer or the separate KB-based installer tweak to enable this functionality).